Quickly and safely locate and troubleshoot hot spots with this combination True RMS autoranging multimeter with a non-contact InfraRed Laser Thermometer. Non-contact InfraRed thermometer measures surface temperature of objects unsafe to contact or difficult to reach. 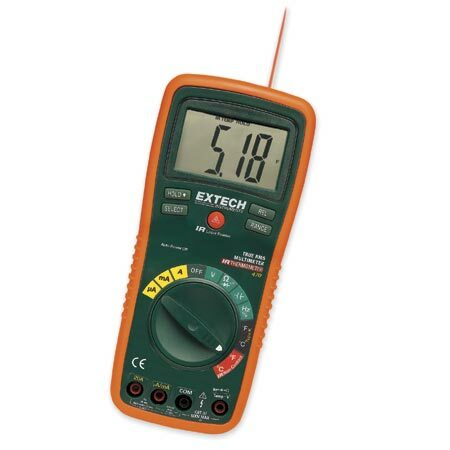 Other functions include high resolution (0.1µA, 0.1mV) measurements, a 4,000 count big digit display, 0.3% basic DCV accuracy, capacitance and frequency functions, plus a Type K thermocouple input for contact measurements. Meter comes complete with CAT III test leads, multi-position tilt stand, hanging strap, holster with test lead storage, bead wire temp probe and 9V battery.